Nothing is more daunting then thinking about repainting cabinetry. Right? No longer! 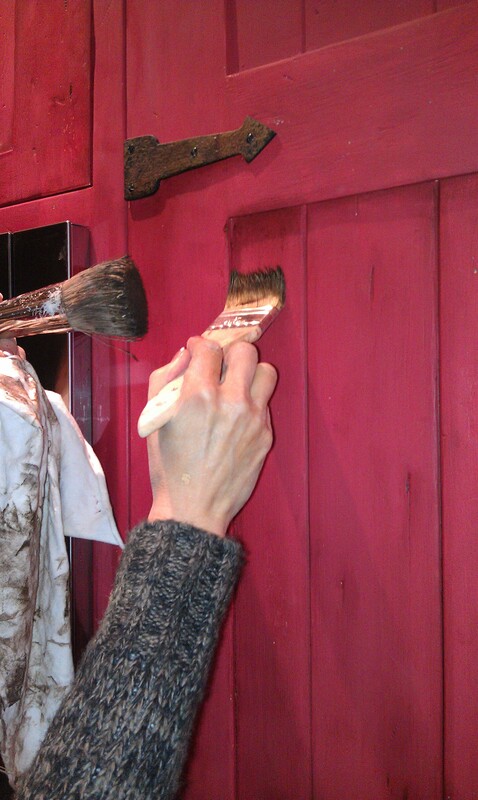 Annie Sloan’s Chalk Paint makes all the arduous preparation a thing of the past. It can be applied to any painted surface. 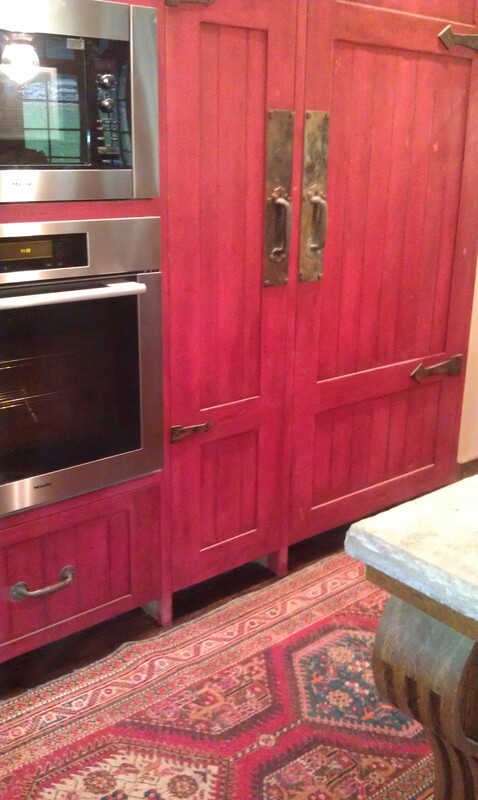 The surface for this Refrigerator wall was painted to start in a latex Ben moore paint, Classic Color 1146. I wish I remembered to take a “Before “pic! Isn’t that everyone’s biggest mistake?? We get so excited about the project and complete it without ever showing how awful it looked to start. Darn. Well, at least I can show you the process. 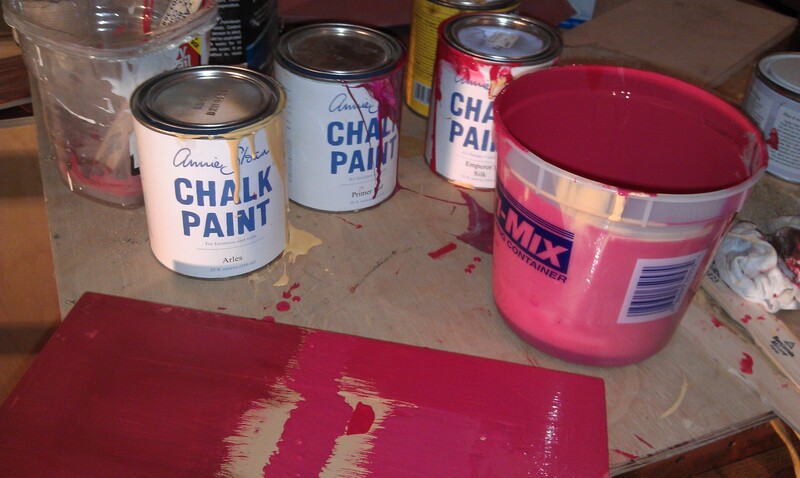 For some reason I can NEVER just use a paint color out of the can the way it comes. Why is that? It’s like disease. For this project I mixed three colors: 3/4 Emperor’s Silk red, 1/4 Arles and a touch of Primer red. ok , I know that’s more than 100% but that’s always how my measurements turn out. After mixing and testing to dry on a sample of wood, you are ready to paint the cabinet. Apply the paint with a wide chip brush or even better, Pierre Finkelstein’s Spalter brush (yes, that’s actually the name of it). As Tiff Ziter said at the Faux Expo, “Here Cynthia, Use this Spalter brush…you will never use a chip brsuh again!” Well, she might be right. At least not for this application…..hard to give up old scruffy chip brushes forever but this brush is a MUST HAVE! Apply the paint heavily so you have complete coverage in one coat. 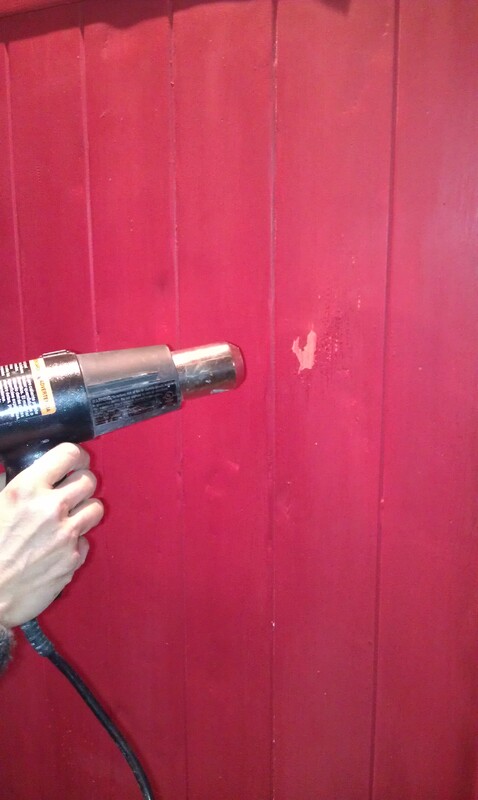 During the application hit the thick spots with a hairdryer or heat gun so they bubble and chip off, giving the affect of old weathered paint. After you have completed the painting and chipping process, let the piece dry overnight. When you return you can begin the waxing process. 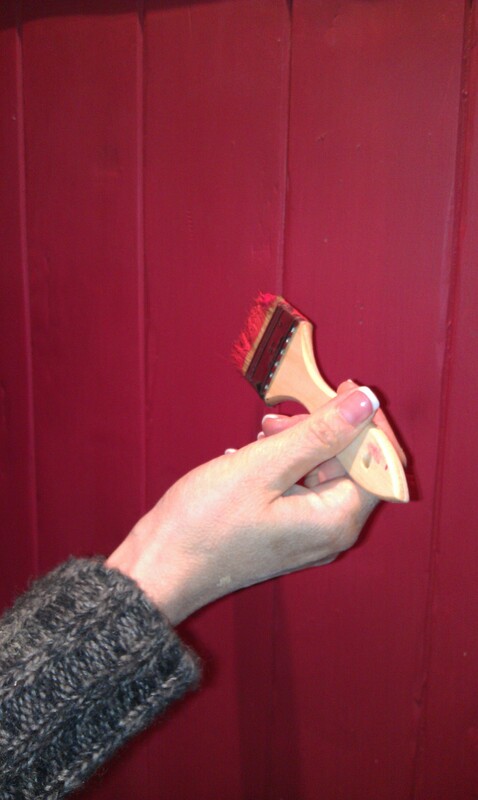 Annie Sloan sells a great brush for waxing. I have to say I also tried The Wallovers Allover brush and it worked great so if you have one of those on hand you can definitely use it! The results are awesome! Lightly coat the surface with clear wax first. This controls the dark wax and enables you to apply it with a lighter touch. The clear wax will allow the dark wax to rest on the surface a bit and not darken it excessively. Start light as you can always build up on the dark wax. And that’s it! With a little patience you can create a piece that looks like its from an old barn. And, because you can skip a lot of the preparation work and sanding and stripping, it is actually fun!